The Indoamerican Refugee Migrant Organisation (IRMO), based in Brixton, is the sort of group that would be eligible to apply for funds. IRMO is a migrant-led organisation that has provided support to the Latin American community in London since 1985. Its main aims are to combat poverty, to defend its community members’ human rights and to empower them to build a stable life in the UK. B£ met up with Jeannine, IRMO’s Project Manager for Family Learning and Children’s Education. Before joining IRMO as a staff member Jeannine volunteered for 8 months for their women’s project, then called El Costurero (the sewing box), whose aim was to create an open and free space where people from different backgrounds could share their thoughts on issues that affect them such as maternity, domestic violence, female representation, as well as topics about community empowerment and the arts. El Costurero had a subtly feminist ethos and covered a range of activities, from Spanish language workshops on prejudice, sexism, and racism, to women’s history themed trips around London. Jeannine is Venezuelan and moved to the UK aged 5. 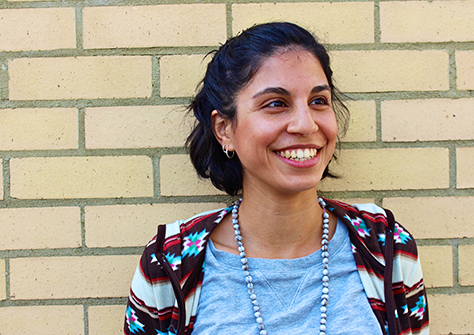 After graduating with a BA in architecture and working in the conservation sector, she went travelling to Colombia and Ecuador, which made her want to be more involved in the Latin American community in London – and that’s why she joined IRMO. “IRMO was set up 30 years ago by a group of Chileans, and at the time was predominantly a refugee organisation, particularly for people who were fleeing the Pinochet regime and other dictatorships in Latin America at the time. Today we still give support to refugees and asylum seekers, but there are less of them, and so our focus has shifted to migrants. The biggest migrant groups these days are Brazilians, and also Colombians and Ecuadorians. We have 6 members of staff and 90 volunteers. About 5,000 people use IRMO’s services every year – mostly latinos and latinas, but our doors are open to everyone. Our focus is to help people get out of poverty, to give them the skills they need to make their lives better. Their ideas are crucial for us – we give them as much lead on the projects as possible. We want to facilitate them to help themselves, rather than impose any solutions. It’s important that we too come from the community: many of our volunteers are Latin Americans, some are recent migrants themselves. Our advisers run drop-in services: immigration advice on Tuesdays, social welfare and housing advice (including taxes and benefits) on Thursdays, and employment rights advice on Fridays. We do have to charge a small fee, but we never turn people down – if someone can’t pay the full price we’ll ask for a smaller donation, and even if that’s too much, we find a way to fit them in – we never just say no. We also provide interpreting services and publish booklets in Spanish about employment rights and other issues relevant to the community. Apart from that we run a number of projects. I work on the Family Project which is funded by BBC Children in Need. We give advice on schooling, housing, anything the families need. Accessing education in Lambeth, and in London in general, can be a long and complex process, and increasingly you need all sorts of documents, like a proof of nationality or a housing contract, which weren’t compulsory before. Lots of applications are rejected. There’s a shortage of places in schools, so children wait from 1-2 months minimum, and up to half a year, which is a really long time for a child to be out of school. A new extension of this project is bilingual support that we provide in 3 schools in Lambeth: we run a homework club, and help students and parents to communicate with the school. We also run English classes for kids, organise creative stuff like a theatre club, and do trips around London, to show the kids around and to point parents in the direction of free things they can do with their children. There’s an additional layer of difficulty beyond the price of things though: a lot of parents work very anti-social hours (for instance as cleaners) so have very little quality time with their children. Housing is also a huge issue. Rent in London is very expensive, so even though a lot of families can pay, they don’t have enough to rent a two bedroom flat to themselves. They want to rent a room in a shared house, but many landlords won’t accept them, claiming they would be too crowded in one room – but often the reason is that it’s harder to evict tenants with children. So many people are forced to sublet or rent without a contract. If people are eligible for council housing, we help them apply, but realistically often all they can get is emergency housing. Many are caught in some bureaucratic catch 22 situation – in order to get certain benefits like housing benefit you have to have a record of employment of something like 6 months, so in the case of recent arrivals we often feel quite helpless. If you can’t afford a house, you aren’t entitled to benefits, and your child is not in school – what do you do? Nobody takes responsibility for these people. They contribute, they pay their taxes, but are treated badly. We’ve had increasing numbers of people turning to us for help. When this project started we used to accept everyone, and now we can only help people whose children aren’t currently in education, and even with that the waiting list is so long. A lot of the people we help came from Latin America to Spain 15-20 years ago, but because of the acute crisis in Spain right now are forced to move again. And it doesn’t look like that process is going to slow down anytime soon. Another IRMO project is English For Work where we run English classes for adults. 50% of Latin American migrants in London (and there are approximately 120,000) work in low paid jobs, as cleaners or kitchen staff. Often their priority is to earn money, and they don’t have time or resources to learn the language, especially if they have children, which in turn makes it harder for them to get out of low-paid work. We provide free language and IT classes and also further job seeking support like CV advice or talks about workers rights from Spanish-speaking union representatives. People often don’t know their rights, don’t know there is a minimum wage or sick pay, and employers take advantage of that. In October we are starting a new project focusing more on career development, access to conversion courses, and other ways in which people can develop their skills and find better jobs. There’s also the women’s project: The Latin American Women’s Circle (El Circulo de Mujeres Latinoamericanas), which provides mentoring to women who aren’t at work, or find themselves in a rut, or in need of support, and helps them get to where they want to be in their lives. It’s also about them having a space: part of the program is organising group meetings which are led by the participating women, a peer support group where they can talk about their issues and struggles. They often tackle topics like gender roles and domestic violence, but the meetings are strictly confidential to ensure the safety of everyone participating. The women support each other, share news, and meet up outside of the project too. The best thing about IRMO is that it really brings people together and creates communities, which are truly empowered to take control of their lives. IRMO’s role is to connect them, but not spoon feed them – they organise themselves. And there is a word of mouth in the community about IRMO, people tell each other that it exists and is a hub and a support point, which is really great. What’s next for IRMO? This year is IRMO’s 30th, which is very exciting! We’re planning a community event in November to celebrate. And in March we’ll host another event, more focused on other organisations and researchers. There isn’t enough research about Latin Americans in the UK. Standard equalities forms don’t include Latin identities, so no data or statistics can be taken away from that. Only in 2013 Latin Americans were included in the monitoring forms in Southwark and in 2014 in Lambeth. In 2011 there was a report called No Longer Invisible which estimated there were 120,000 latinos and latinas in London, most of them in Lambeth and Southwark, but that’s not nearly enough research. Latin Americans are invisible in the equalities statistics, but they often are also invisible in another sense – because so many of them work in the hours when most of us are asleep. We want to change that. We’re also going to be running a campaign around the mayoral elections, to get Latin Americans to register to vote. Already during the general election we promoted hustings and worked to get people more involved and interested in who is in power, who is representing them. But to keep up with all that work, IRMO really needs some funding. Any amount of money would be useful, would help to fund more activities, but also simply pay for rent and bills. In February we organised a very successful fundraiser week, we raised over £6,000. Our rent went up loads, and it keeps going up; it’s happening everywhere in the area, like in the Brixton Arches, and it’s happening to us too. We could do so much more with extra funds. We could provide more funding for drop-ins, we could provide more childcare facilities so more people could use our services without worrying about their children, we could relaunch the youth project which we had to reduce dramatically. At the moment we have a bit of funding to run a one-off event for young people, which they are really doing themselves, they got a budget and are planing and organising it. But we’ve not got much for them beyond that, and with more funding we could have a separate project focused specifically on youth. If they don’t know English they can be the hardest age group. And we’d like them to have aspirations, dreams, perspectives. We’re always looking for more volunteers, interpreters, translators, English teachers for adults and children (5-12 years old) – so if you could donate your time, please do get in touch with us. We also really need laptops in good working conditions, bilingual Spanish/English and Portuguese/English dictionaries, arts & crafts materials, school equipment, good English reading books for children learning to read. If you’ve got a B£ account, you can donate to IRMO by texting ‘pay IRMO [amount]’ to the Brixton Pound payment number (07754832867). Whenever you buy a Brixton Bonus ticket, you will be contributing to the Fund, which will then support groups like IRMO. One more reason to get involved! This entry was posted in news and tagged brixton, brixton bonus, brixton fund, children, community, family, fundraising, local heroes, local organisation, women, youth on September 10, 2015 by brixtonpound.